Free Beach Chairs! Comfy King bed. 2 Queen beds. Sleeper Sofa. 2 Full Baths. 1 Half Bath. Sleeps 8. Book online! Vacation Villa Balcony Overlooks the Pool. You are just a few steps to a refreshing swim. Spacious Living Area at Vacation Villa Fully Equipped Kitchen for your convenience and economy. Enjoy your morning beverage at the breakfast bar. Comfortable casual dining. Spend some time together while on Vacation. Comfortable King Bed in Master Bedroom Relax and sleep in. Enjoy your favorite morning show. Private Master Bath connects to the Master Bedroom Another View of the Master Bathroom Guest bedroom with two comfy Queen Beds You`ll like the flat screen TV in the Guest Bedroom Private Bathroom connects to the Guest Bedroom for your Convenience. Powder room on the main floor for your convenience. Comfortable Seating for you and your guests. Enjoy a spacious place to entertain your family and friends. Comfy Queen Sleeper Sofa with Sealy Mattress Enjoy the new 55 inch flat screen TV and Blu-ray Player. This place has a 2nd floor balcony with bistro table, overlooking the pool. Relax on the ground floor patio, just steps to the pool. Full size washer/dryer in the townhome for your convenience. Free Beach Set-ups provided for you during your stay. Look for the red and white beach set-ups. Take a dip in Pool 1, just a few steps from your patio. Woodland Shores community has two pools Just steps to either pool from Vacation Villa. The grounds at Woodland Shores are manicured to perfection You and your little dog will enjoy the grassy areas at Woodland Shores. Look for this sign to welcome you to Vacation Villa in Woodland Shores. The sugar white beach, just a short walk away, is gorgeous year-round. Wow What a gorgeous way to spend your vacation. Thank you for taking time to leave this review. Please come stay with us again Thank you for this lovely review. We`re glad you enjoyed your stay. This lovely town home is a spacious comfortable vacation home where one large family, or 2 families or 3 couples can vacation at the beach together with plenty of room to spare! And you can bring your little dog with you! Vacation Villa is totally redecorated with new furniture, bedding, etc. You will find this large Woodland Shores townhouse comfortable, affordable and surprisingly convenient to the beach. Bonnie from Pasadena, Texas said: "The condo was very nice, very clean, and close to the beach as described. Despite the rain, we enjoyed our visit and would highly recommend to others. A great value!" Crystal from Ozark, Arkansas said: "My family and I had a wonderful stay at the villa 21 at Woodland Shores. This townhouse is in a great location, short from the beach with an at home feel. The swimming pool is clean and you have access right outside your door. The locals are very nice and make you feel like you belong. I recommend bringing your family as this was a very comfortable home with all the amenities!" Discover Vacation Villa at Woodland Shores -- the best kept secret in Destin! A short walk to Scenic Gulf Drive and to the sugar white sandy beaches of the Gulf. 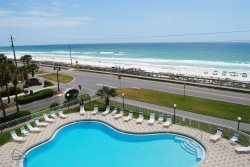 This is gracious vacation living in a totally redecorated spacious vacation home in Destin. Take a 5 minute stroll to the beach where you will be treated to two beach chairs and an umbrella set up for you every day of your stay during the season (March - October). Additional chairs and umbrellas can be rented from the beach attendant, or you can take your own equipment to set up any time of the year. A friendly front porch welcomes you to this beautifully decorated town home. We are re-decorating Vacation Villa in a beachy but subdued color palette, blue gray and light tan. Very pleasing to the eye, but with a beachy whimsical interior that says 'you are at the beach -- so enjoy yourself!' You will be relaxed in this tastefully decorated environment. The living area boasts cathedral ceilings, giving the main floor a feeling of spaciousness. Enjoy your favorite TV show or family movie on a large flat screen Samsung Smart TV, complete with DVD player. Flat screen TVs are installed in each bedroom upstairs, with a DVD player for your enjoyment in the master suite. This gracious town home boasts 2 spacious master bedrooms upstairs -- one with a king bed and one with 2 queen beds. Each bedroom has a full private bath. A tub/shower combination awaits you in the king bedroom bath. The guest master also boasts a walk in shower. A sleeper sofa on the main floor compliments the sleeping arrangements to sleep 8 comfortably. For convenience, there is a half bath on the main floor. This arrangement allows 3 couples to stay at Vacation Villa, or 2 couples and children, or just 1 family or a couple. The laundry area conveniently located in the kitchen area boasts a full sized washer and dryer to keep your clothes and towels fresh and clean. We provide free high speed wireless internet for your convenience, Vacation Villa's kitchen is perfect for preparing meals, if you decide to cook your favorite meal after a fun day at the beach. Newly decorated, this huge kitchen is equipped with plenty of cabinets, including a family sized pantry to store your goodies. All full sized appliances, plenty of pots and pans, dinnerware and silverware. Keurig coffee maker and a regular coffee maker are both available for your use. Outdoors, you'll relax on the ground floor patio where you can see the pool and gazebo. Plus, you'll enjoy a second floor balcony to step outside to hear the birds sing! Bring along your beachwear and beach towels and some great food and you're set! Clean and fresh linens are installed on all beds and in baths, so you are ready to begin enjoying Vacation Villa as soon as you arrive! You are only a short stroll away from the famous emerald green water of the Gulf of Mexico. In addition, this comfortable town home is close to everything Destin has to offer. You are 2 short blocks from world famous Pompano Joes gulf front restaurant. A quick drive will take you to area grocery stores. The Commons Mall and Grand Boulevard, are nearby, where you can treat the family to a movie at a spectacular theater. Visit Silver Sands Premium Outlet mall which offers huge discounts on designer goods. Just minutes away are go karts and the Big Kahuna Water Park if you wish to gather the family together to take a day off from the beach to have even more fun! Plan a great family vacation -- Reserve your vacation at Vacation Villa today! Perfect for 2 families or 3 couples -- affordable for everyone! Corner unit -- quiet, with lots of light. A Keurig coffeemaker.. Bring your favorite K-Cups! A regular coffee maker is also available. Our stay here was amazing! We walked in and it smelled super clean. We felt right at home. We truly enjoyed it and it was convenient to a lot of places. Beds were super comfy and all the neighbors seemed very friendly and welcoming! Vacation Villa is a new property to our management program. Located in beautiful Woodland Shores, it is a complement to our Gulfside Getaway, which has been very popular in its first year on our program. These are very spacious and easy living townhomes with pools a few steps away, in a quiet family neighborhood. Woodland Shores is 5 minutes from the Gulf, where beach service is complimentary for our Vacation Villa and Gulfside Getaway guests. Book your vacation today!